People have always been on the lookout for the ultimate party food. In 2013 more than ever, not only is convenience a buzz word for party hosts, but also they want to find food that is healthy and a talking point. Look no further than traditional Japanese sushi for all of these elements. Originating from Japan, sushi comprises of rice that has been cooked and seasoned in vinegar combined with other ingredients, usually raw seafood. The rice is a constant in sushi, which can be presented in a range of different ways, including rolled in nori (seaweed) or hand pressed. Over the past twenty years or so, sushi has become increasingly popular across the world, with sushi restaurants opening in major cities and now even supermarkets offering their own take on sushi dishes. Fast forward to 2013 and the next step in sushi has arrived in the UK. It is now possible to order and have delivered a range of sushi as simply as getting the traditional staples of Indian or Chinese food. 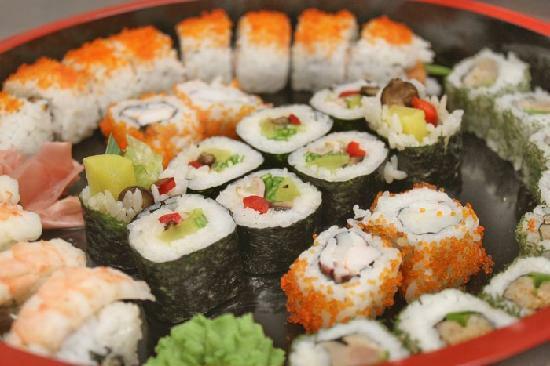 Whether you fancy a sushi treat for you or your family, you are planning a Japanese themed dinner party, or you are catering for a drinks party, sushi delivery is a fast, convenient and cost effective way of eating traditional Japanese food at home. Sushi delivery is available in many areas of London, with a range of delicacies available, from soups and starters through rolls, sashimi and hot dishes. If you are having trouble choosing, you could always plump for a box which contains a mixture of different sushi foods. Whilst sushi is always served cold, there are also a range of hot meals available for those who prefer eating a more traditional meal. Why Order Sushi For A Party? Given the small size of sushi items, they make for perfect finger food at a party, great served with drinks as your guests arrive, or as canapps throughout your function. Similarly, the fact that sushi is served cold means that you don’t need to worry about cooking, or keeping food warm before being served. All that is really needed is ample space in the fridge for all of the delicacies. Given that it is fairly unusual to be served at a party, sushi will also provide a great talking point for your guests. Sushi has always been food designed to be served at social functions, similar to Tapas in the Spanish culture. Traditionally served in a very minimalistic fashion either on wooden or lacquered geometric plates, sushi can be delivered to you presented beautifully to really make your party go with a bang. No longer is healthy food destined to be dull, lifeless and bland. Of course people want to eat well, but at a party, people want to have a treat and indulge in something a little naughtier. Thankfully, by ordering sushi, you give your guests the best of both worlds. Not only is sushi low in fat, but it is also nutritious, great for you and tastes fantastic. Idania writes regular articles for a range of websites such as http://www.youmesushi.com on a number of catering and social subjects. When she isn’t writing, Idania can often be found digging in her garden.